KANSAS CITY, MO (KCTV) --- After several inches of snow fell on the ground in Kansas City, many in the city needed some help getting around. 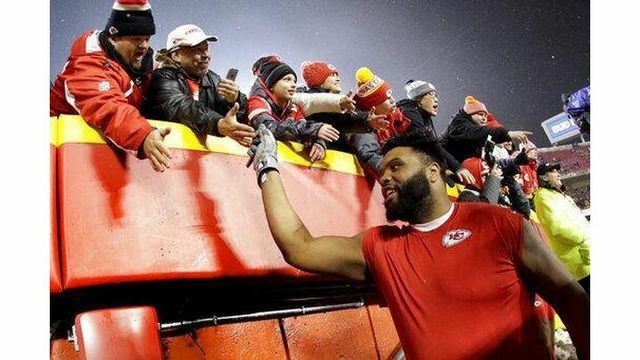 That included Kansas City Chiefs offensive lineman Jeff Allen. Allen tweeted late Saturday night that someone assisted him when his car got stuck in the snow - and he wants to reward him with AFC Championship tickets. "My car got stuck in the snow before the game & a nice guy named Dave help pull me out without knowing I was a player," Allen tweeted. "I want to give him tickets to the AFC championship game for helping but don’t have a way to contact him. He drove a 97 or 98 Black Suburban." By Sunday afternoon, Allen tweeted and said he had found the man. The Chiefs defeated the Colts 31-13 on Saturday. Arrowhead Stadium will host its first AFC Championship game next weekend.